I’ve pondered death as long as I’ve been literate. I devoured Chinese folklore picture books depicting 18 levels of hell each with their unique forms of torture. While other carefree preschoolers busied themselves playing games in the playground, I stayed inside and read stories about mythical kings who turned their kingdoms upside down in order to secure eternal life potions. I, like the power-hungry dictators of these stories, coveted eternal life potions. I remember wishing I was a rock, because rocks, well, live longer than human beings. When I exhausted all of my angst fearing death, I spent time worrying about all of my loved ones, and mentally procured eternal life potions for them as well. As an adult and now living in the digital era, I am still fascinated by death. I am among the many fans of Caleb Wilde, who shares death related humor and stories as a professional Funeral Director. I followed closely reporter Scott Simon and comedian Laurie Kilmartin, who both tweeted live from their dying parents’ bedside. I am thankful for the ways social media de-mystify death, and allows the public, those of us who haven’t yet suffered personal losses, a glimpse into the world of the dying. Of course, it’s not like I am unique in having some sort of weird death obsession. The universality of death draws us into contemplation. Unlike any other creature on earth, we think about death. And we do it, because it causes us to reflect on how then, do we live? We carry with us, as human beings, an existential anxiety regarding death, because the threat of an impending end to our lives makes us wonder whether our lives matter. We have an existential anxiety FOR significance. Recently, Jason and I heard the news of the passing of our professor from Fuller Seminary. Dr. Glen Stassen was one of the most influential teachers from our seminary days. So much so, we had named our son the Chinese name, Jian-Ping (literally meaning building-peace), to honor his teachings about peacemaking. As I read through beautiful tributes written for him, I was inspired by the legacy he leaves. Although I can’t ever hope to have the breadth of influence Dr. Stassen had, a part of me deliberates what sort of impact I would have. These are the kind of thoughts which plague our minds when death intrudes into our lives. These life crisis moments sometimes catapults us into a state of panic and we begin to question our current life situation. Because we aren’t able to take a full accounting of our impact, we default to feeling insignificant. Some of us begin making plans to start working, quit our jobs, have more children, start a ministry, leave a ministry, ask for a promotion, climb the corporate ladder, clamor for attention, desperate to do something which will propel us on the right track to matter more. The problem with this race for significance is its inherent narcissism. Even if our work is altruistic on the surface, i.e. operating a non profit for children with cancer, our drive to succeed in leaving an impact is ultimately still about us. Monitoring the social media reach, checking the numbers on our email list, growing the brand, even if it’s for a good cause easily slips into idolization, a grasping of a thin success. Worst of all, as we climb the ladder to success, we sometimes are stepping on the heads of others in order to do so. I wonder if we are asking the wrong question. Instead of asking whether we are making an impact on others, we figure out ways to make sure other people know they impact us. How many times have we been profoundly affected by someone, whether it’s through their public teaching, or through private interaction, and we NEVER TELL THEM. I don’t know about you, but I don’t want any of my Life-Changers to go to their graves without knowing how they changed my life. How that one unintentional act of kindness saved me from a season of discouragement, how their story-telling made me feel less alone, how an expression of love empowered me to pay it forward. Instead of taking a full accounting of our own impact, we make it our job to ensure others know theirs. What would happen if we GIVE significance instead of trying to GAIN significance? What if we looked for the most unassuming members of our society, the least significant family member, coworker, school mate, neighbor, and we show them how they are significant to us? The burden of our existential anxiety for significance can not be alleviated on our own; it can only be lifted off of each other. Together, is how we make an impact. 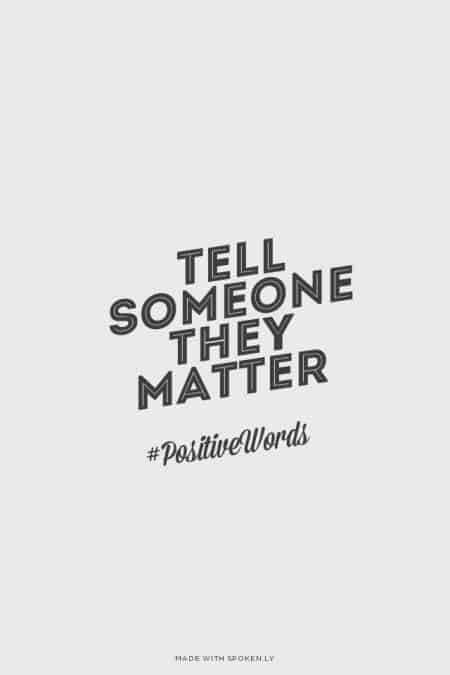 Here’s how to be significant: tell someone how much they matter to you today. *When is the last time you told someone how valuable they are to you? What are some concrete ways we can show people they matter?